"Here's how to prepare for your cat giving birth to kittens." Cat pregnancy and birth are a natural part of an unspayed female cat's life life. If this is the first time your cat is delivering kittens, she may be a little nervous, but her natural animal instinct should still kick in. This article primarily discusses how you can set up a safe comfortable area for your pregnant feline to deliver her kittens. Your pregnant kitty will start looking for a place to give birth at around the seventh week of feline pregnancy. If you normally let her go outside, now is a good time to keep her indoors so that she doesn't look for a birthing place (a "nest") outside. Birthing kittens outdoors leaves them vulnerable to predators and other dangers (plus you miss out on all the fun of seeing the newborn kittens!). You should also take care to not to let your pregnant cat start to prepare a nest in places you don't want, like an open drawer with your favorite sweaters or a pile of clean laundry! The safest place during the later stages of cat pregnancy and birth is indoors. To help make the process easier for your cat (and yourself) you'll want to prepare an ideal place for her to give birth to her newborn kittens. You could start preparing a "kittening box" or set up another comfortable area for your kitty to give birth. Of course, she may have other plans! Kittening box just means an enclosure of some sort (it could even be a laundry basket) for your cat to give birth to her kittens in. It's also called a "birthing box." You can find special boxes for kitten birthing in some pet supply stores, but a homemade one will serve just as well. A cardboard box works great because it's inexpensive and you can easily dispose of it when you no longer need it or if it becomes soiled. Here are the steps to properly prepare a homemade birthing box. Find three or four clean cardboard boxes about the size of a wine case. (I've been informed that a wine case holds 12 bottles of wine!) Check for staples or other sharp or dangerous objects, and make sure the boxes weren't used for packing harmful substances. The top flaps of the boxes should be able to loosely fold over to offer your cat some privacy. Add a comfy lining (see below). 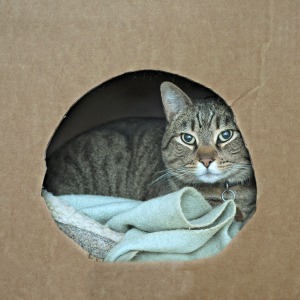 Your cat will ultimately only use one box for the actual births, but you'll want to put three or four in different locations to allow your kitty to choose her favorite spot. Having them in different locations will make it more likely that the momma-to-be won't have the kittens somewhere you don't want her to. You'll also want to save the extras in case the first box becomes too soiled. Some soft clean kitchen towels make the ideal bedding for your pregnant cat's kittening box. Crumple them up and place them in the bottom of the enclosure. Don't count on using the towels again. Cat pregnancy and birth gets kind of messy! Although it might seem more practical, don't use newspaper for the bedding as it contains printing ink with chemical solvents which can negatively affect your cat's health, and especially her kittens' health. If you don't have spare towels, you could also use an inexpensive shelf lining paper. Crumple some paper to make a soft bed for the bottom. As any cat "owner" knows, felines are creatures of habit and they certainly do have their own ideas about things. And cat pregnancy and birth is no different! You can really only offer "suggestions" to your cat about where to give birth to her kittens. She'll ultimately determine the birthing location. However, you can try to guide her by placing the kittening boxes in desirable places for both you and the momma-to-be. Although your cat may want some privacy for the delivery, she is still part of the family and will want to keep track of what's going on. So the best place for the kittening box is a warm and draft-free place within sight and sound of the household activities. Of course, these are only suggestions you make to your pregnant feline. Placing the three or four boxes in different places gives her more options and allows her to decide which one she likes best. If she rejects your choices and prefers another spot, you should go along, as long as the temperature of the location is alright and it's a draft-free, fairly quiet location. You can try to persuade your catmthat your chosen spot is best by showing her the birthing box and how ideal it is for giving birth. You can rustle the bedding and try to entice her inside (maybe with some treats) to see how comfortable it is. Show her how she can have privacy with the top flaps folded over. Once again, if your cat refuses your chosen spots, let her choose her own, and be careful to keep locations that you absolutely don't want her to give birth in inaccessible to her. 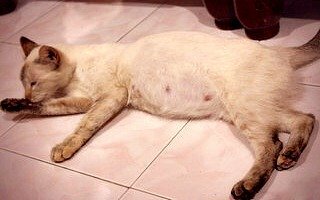 Cat Pregnancy Symptoms - What to look for to determine if your feline is pregnant. If this is your first cat pregnancy and birth, consulting your veterinarian for more pointers is a great option. Be sure to have your veterinarian's phone number and a 24-hour emergency vet's number close by.